NEW ENGLAND dot MEDIA is a creative agency and media platform in one. We provide our clients services from logo design to web design and everything in between while operating multimedia platforms in the Home, Golf & Lifestyle Industries. For over 35 years we have been an industry leader in the publishing of niche lifestyle publications and custom print media for hundreds of businesses through over 6000 managed delivery locations throughout the region. We strive towards making our creative agency the most unique and highest quality in the market. CASTLE EVENTS, the producer of New England’s largest and longest running home shows, is responsible for creating four of the best attended and most professionally run events in the industry. With a combined 100 years of experience in the trade show industry, we have successfully developed new and innovative show concepts to target both exhibitors and attendees from all market segments. Our event venues offer shopping and dining which create a “destination-like” experience for all who attend. It is our goal to produce face-to-face connections with all of our home show experts, products, and services, to ensure the most successful environment for all involved. We continue strive towards making our events the most unique and highest quality in the market. New England HOMELIFE is published 6 times annually (every other month) in a 9×11 perfect bound format with a soft touch cover. Our magazine focuses on the Lifestyle of Owning a Home including the best in interior design, architecture, landscape design, home products materials, technology, community, dining, shopping, real estate and more. Our goal is to educate and bring awareness to potential customers for marketing partners products/services in the homes, lifestyle and leisure markets. 2500 Copies – Marriage Mail – Direct Ship Locations – Metro West – Northshore – Eastern, MA – Commercial Locations – Office / Commercial Businesses waiting rooms and lobbies. (Multiple Title Magazine bundles for Business) * N.E. Marriage Mail Corp.
2000-3000 – Per Show– Home Shows – Jan – Feb – March –April. 1000 Copies – 150 + Location Dealers – New England Carl Dealers Association Members – Service Waiting Rooms. 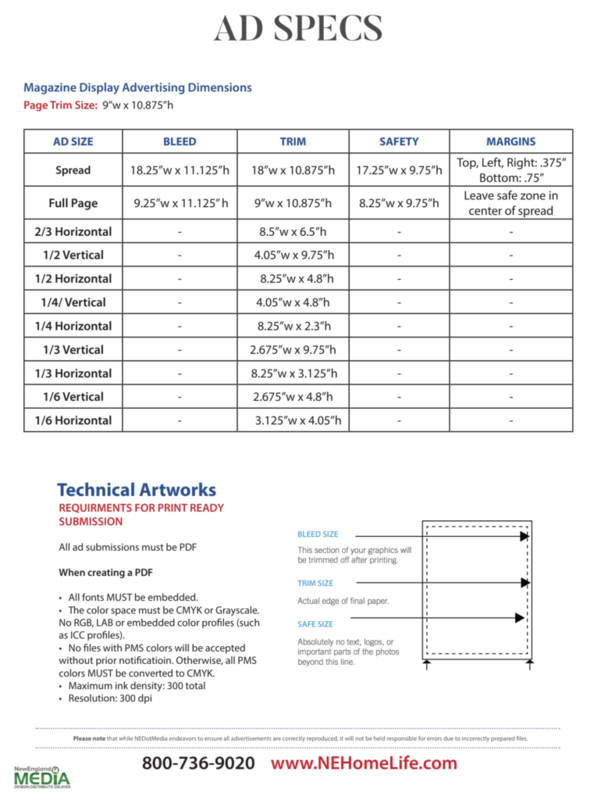 200 – 500 Copies – Office Stock – Client inquiries – USPS / UPS. * Circulation numbers vary at bulk delivery locations, monthly & seasonally. Grocery, banking, transportation, auto service, gyms and professional offices represent our largest copy circulation and largest repeated readership. Real Estate, mortgage firms, doctor offices, insurance companies, appraisers, construction, builders, restaurants, lawyers and others represent small quantity delivery of 5-10 copies per location. Our circulation is managed by a circulation and delivery audit programs by Pro Lo Services of Boston, the largest and most reputable delivery service in New England. * All clients can submit preferred added delivery stops for bulk copies in any market location that will be added immediately to our monthly delivery. OPENhouse – Open Houses, Hot Listings, Lenders, Insurance etc.